Shopping and food – my kind of day!! We started with breakfast at Whispering Canyon Cafe, which isn’t quite as raucous as dinner, but there is still fun and games to be had. Again, you get the little card which you can flip to red if you don’t want to get involved in the shenanigans. You can read more about Whispering Canyon Cafe on my blog here. Our server had quite the loud voice – too much for me early in the morning! But all in all, we had a good breakfast here. We’ve now eaten at WCC for all three meals – breakfast, lunch, and dinner; so I think we can have a break from it for a while now! Them milkshakes though… you can have them for BREAKFAST y’all! And they’re refillable too! You can see all of the photos from this day on my Flickr here. When it comes to the Deluxe Disney Dining Plan for breakfast at a table service restaurant you are entitled to one entrée, and one non-alcoholic beverage per person (usually refillable) for one credit per person. After our breakfast, we took a bus (don’t fall down in shock!) 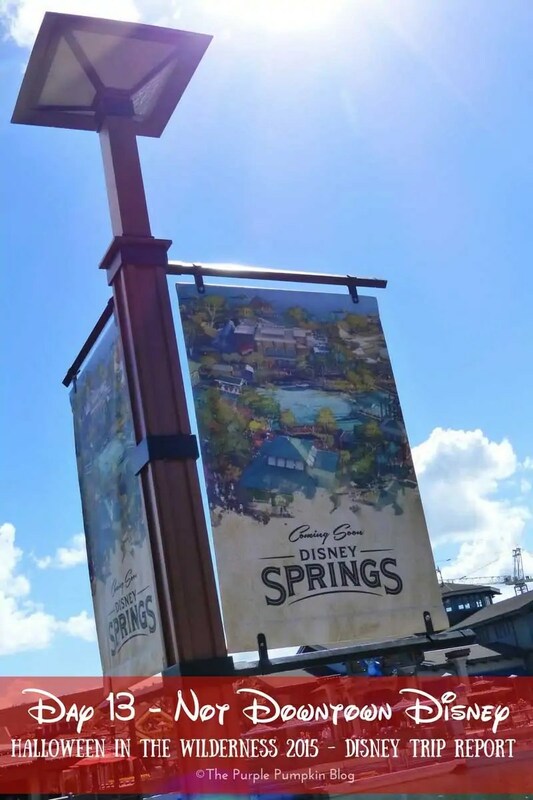 to Disney Springs. With the new road layout, and roadworks still going on, it just felt easier to catch one of the Disney buses! Steve and I grabbed a drink from Starbucks ($11.61), and Liam wanted a drink and a pretzel from Wetzel’s Pretzels ($7.22). We paid for these using snack credits, and sat down in a new seating area in front of a stage, where an all-girl choir were performing. Lots of money was spent, as it always is – mainly in the Christmas store! But we also bought some LEGO in the, err, LEGO store. Liam bought himself a couple of Star Wars sets with some money his grandparents had given him, and we bought some sets for the LEGO game on our WiiU. This is our fourth visit to Orlando, but it was the first time we’d ever been in the LEGO store! It always seems really busy which is why we avoided it, but this time we took a gander, and came away lighter in pocket!